I finally made a withdrawal from the Sprinkles ATM when Cousins Jackie and Jessica came to town for a short visit. 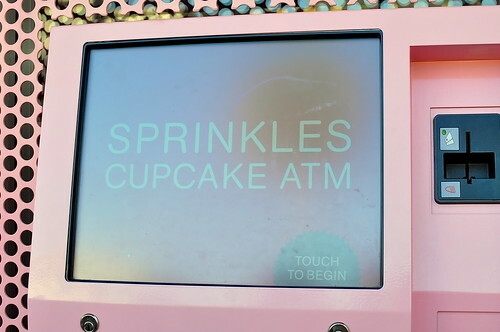 As part of a whirlwind tour of Los Angeles that included a stop at the Santa Monica Pier, a stroll down Rodeo Drive, and dinner in Thaitown, we swung by the ATM for the pleasure of having a cupcake delivered via robot claw. It was a riotous occasion. 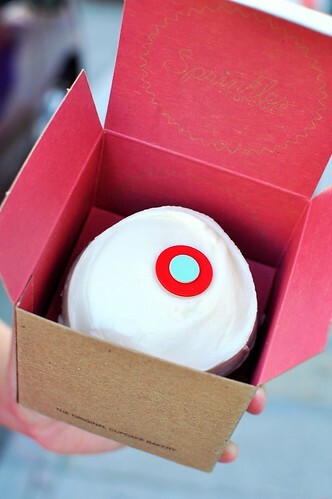 The Sprinkles ATM, which debuted in March in the space next to the original cupcakery, provides a sweet fix to cupcake lovers 24 hours a day. The machine stocks an array of freshly baked cupcakes that always includes Red Velvet, the shop’s most popular flavor. Of course, if one’s favorite flavor isn’t available inside the machine, the Sprinkles brick and mortar is only a few short steps away. With its bright blue, pink, green, and red stripes, the Sprinkles ATM is a real looker. While the machine is far more attractive than an ordinary bank ATM, the experience of purchasing a cupcake feels surprisingly similar to making a cash withdrawal. A touchscreen monitor lead me through the process of choosing a flavor and making a purchase. Cupcakes, which are regularly priced at $3.50 inside the shop, are priced at $4 at the ATM. I didn’t mind the surcharge on my inaugural visit, but would likely feel the pinch on subsequent visits and head for the shop instead. I selected the red velvet since it seemed like the quintessential flavor and I’d never before tasted Sprinkles’ version. The cupcake arrived neatly nestled in its box—not a lick of frosting was out of place. Ironically, we took the cupcake inside the shop to enjoy it. The Sprinkles ATM delivered on all fronts. The product was as fresh as advertised and the experience was perfectly fun. I’m glad I got that out of my system. I’ve been wanting to try this machine and hoping they bring one to SD. Looks like a lot of fun! I’m wondering if the box is the reason it’s more expensive… I know they charge more if you ask for a box with a single cupcake in the store itself rather than the standard bag! Either way, dying to get my cupcake vend on. Must make it happen this summer! This has been on my list of things to do this summer. I’m sure there will be lots of squeals involved. You made it sound like a hoot, so now I’m really gonna dig it. dying to try this atm but can’t deal with the line that is always in front! 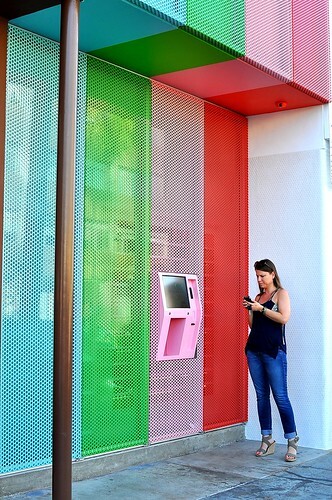 Nastassia – Due to the craziness next door at Sprinkles Ice Cream, we were treated to a line-less ATM experience. Woooooooot! Wow! Awesome! I think if I ever make my way to CA then I will definitely have to stop there. wow! its really cool…i really want to try it. It seems like a lot of fun.